If you are looking for a great pair of sandals, this Betty London pair is for you! Quality is guaranteed with a fabric upper and rubber sole. 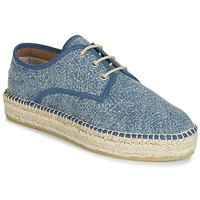 With their fabric lining and fabric insole, these shoes are very comfortable! We love their look and feminine style. Your Easy Shoes! Model with Y.E.S. technology : memory foam with breathability, durability and anti-bacterial properties. YES technology offers a cushioning memory insole that provides immediate and lasting comfort. SHAPE MEMORY: The foam, chosen for its durability properties, absorbs shocks during walking, which protects the foot and joints. BREATHABILITY: The foam used is also composed of open cells, promoting the evacuation of perspiration and thus good breathability for your feet. ANTI-BACTERIAL: In addition to its natural properties, open-cell foam is treated with anti-bacterial treatment. To learn more, click here.